The first edition of this excellent handbook was extremely well received by both students and lecturers alike. It has helped to simplify the often complex and difficult task of choosing and using the right statistics package. 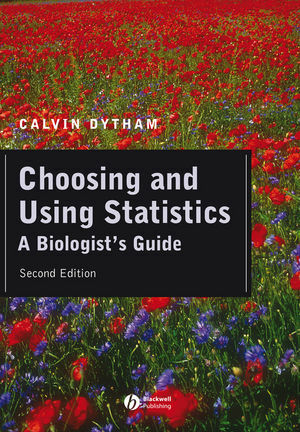 This is a book for any student or professional biologist who wants to process data using a statistical package on the computer, to select appropriate methods, and extract the important information from the often confusing output that is produced. It is aimed primarily at undergraduates and masters students in the biological sciences who have to apply statistics in practical classes and projects. Such users of statistics do not have to understand either how tests work or how to do the calculations, and these aspects are not covered in the book. The new edition has been updated to cover the very latest versions of the computer packages described, expanded to include coverage for logistic regression, a more detailed consideration of multivariate analysis, data exploration and further examples of Principle Component Analysis and Discriminate Function Analysis are given. New edition will use SPSS 10.0, Minitab 13.1 and Excel 2000. New simplified version of the Key and flow chart of decisions to reach simple statistical tests. Section on multivariate techniques expanded to give further examples of PCA and DFA. Aimed at students using statistics for projects and in practical classes. Statistical jargon explained through an extensive glossary and key to symbols. Stresses the importance of experimental design, measurement of data and interpretation of results rather than an understanding of the statistical tests themselves. Calvin Dytham has a wide range of research interests in ecology and evolutionary biology and is especially interested in the impacts of dispersal and the arrangement of individuals in space on ecological and evolutionary processes. He is a Reader in the Department of Biology at the University of York, UK, and has been teaching statistics to undergraduate and postgraduate students since 1994. 1. Eight steps to successful data analysis. 3. Choosing a test: a key. 4. Hypothesis testing, sampling and experimental design. 5. Statistics, variables and distributions. 6. Descriptive and presentational techniques. 7. The tests - 1: tests to look at differences. 8. The tests - 2: tests to look at relationships. 9. The tests - 3: tests for data investigation. 10. Symbols and letters used in statistics. 12. Assumptions of the tests. 14. A table of statistical tests.